Renovations in the bathroom can be a big headache. After all, it’s a room that’s quite different from the rest of the house. For one, it’s more humid in the bathroom. It’s also usually smaller than other rooms, so interior designers need to be smarter about taking advantage of the available area. Mixing function and style in a limited space is challenging. One way to maximize the entire room is to use all of the elements inside – like the walls. This ideabook focuses on wall coverings, which can breathe new life into any room with the right execution. There are several options you can go for, from low-maintenance tilings to beautiful wood. 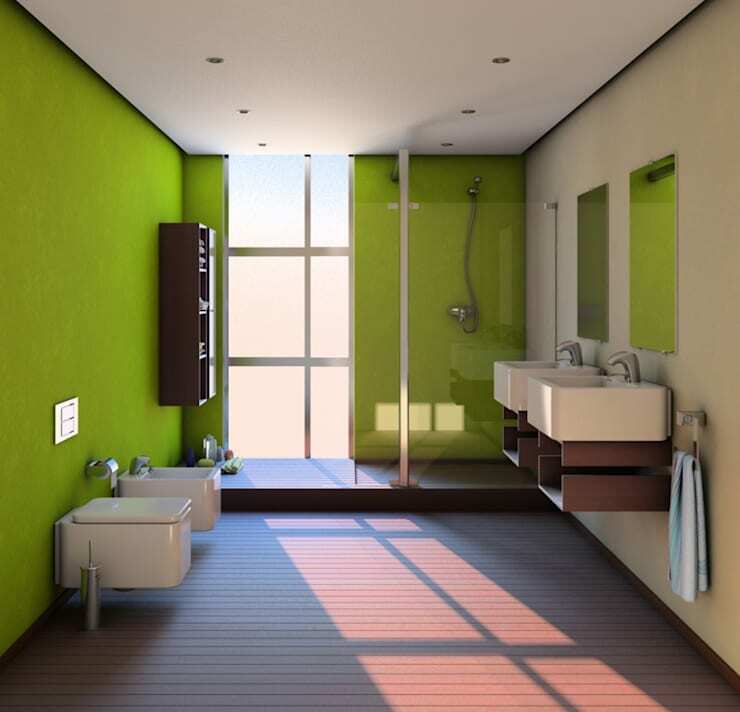 Get an idea about different kinds of bathroom wall coverings below. We’ve said it before: tiling never goes out of style. 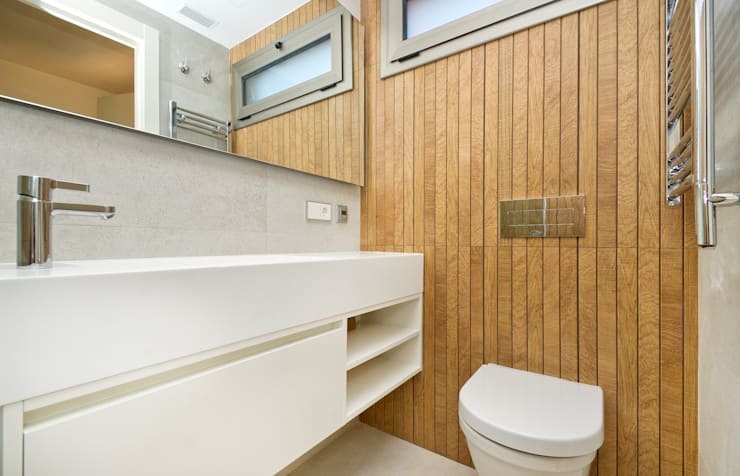 Tiled bathrooms are very common due to a variety of reasons. Not only is tiling resistant to changes in the temperature, but it can also withstand extreme humidity and steam with no problem. It’s also known to be a very durable and low-maintenance material, plus versatile enough to suit different design styles. 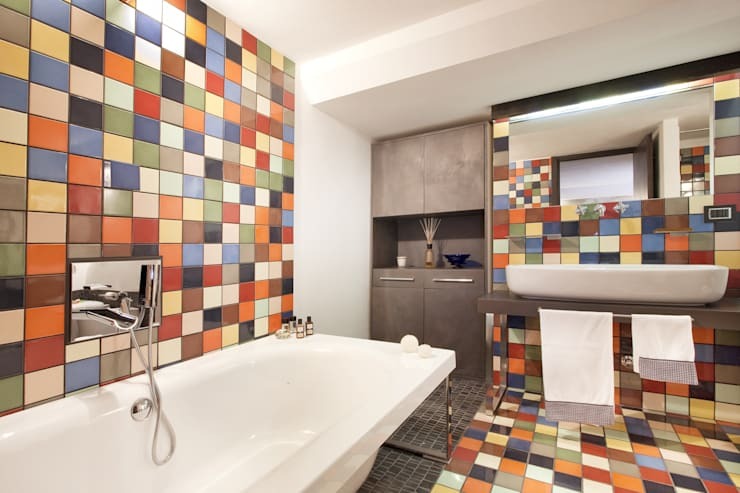 This vibrant tiled bathroom is found in a modern industrial-style loft in the city of Milan. While there are no windows, it remains bright and cheerful due to brilliant lighting and a colorful collection of tiles on the walls and floor. It’s perfect for those who want a fun and youthful touch to their bathroom. Many people are still reluctant to use wallpaper in the bathroom, because of the belief that it doesn’t hold up well to moisture. However, modern vinyl wallpapers are actually resistant to humidity. While it’s important to consult professional interior designers to make sure you’re picking the right kind, it is now safe to cover bathroom walls with wallpaper. One important advantage of wallpaper is its affordability. The material and its installation will cost homeowners far less than other types of wall coverings. It’s also gives the residents a lot of options with endless of colors and patterns. 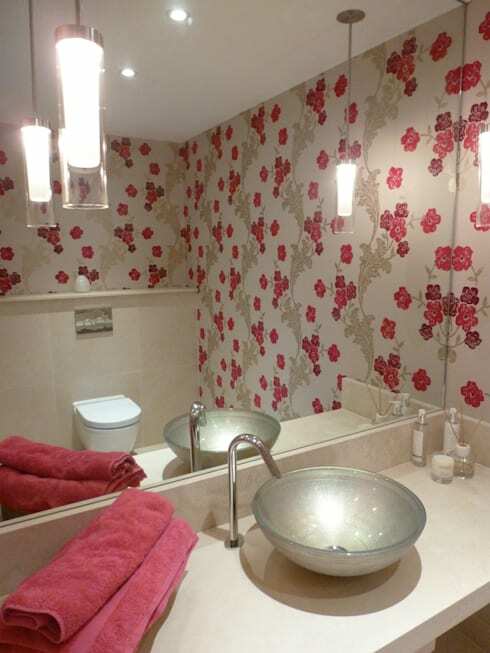 In this featured bathroom, a flowered wallpaper adds a rustic and cheerful touch to the room. Wooden walls in the bathroom are quite surprising. However, it’s not as rare as one would think. In fact, it adds a warm and somewhat spa-like tranquility to the space. Tropical woods like teak are the best choice, so it could better withstand steam and moisture. It’s important to maintain wooden bathrooms regularly, though. Try applying polyurethane protection to it. Polished is another very common material for wall coverings due to its waterproof quality and its great adhesion. It’s one of the easiest and simplest materials to maintain as it doesn’t have joints where dirt can accumulate. A versatile material that comes in a variety of finishes and hues, cement also goes wonderfully in houses inspired by the industrial aesthetic. 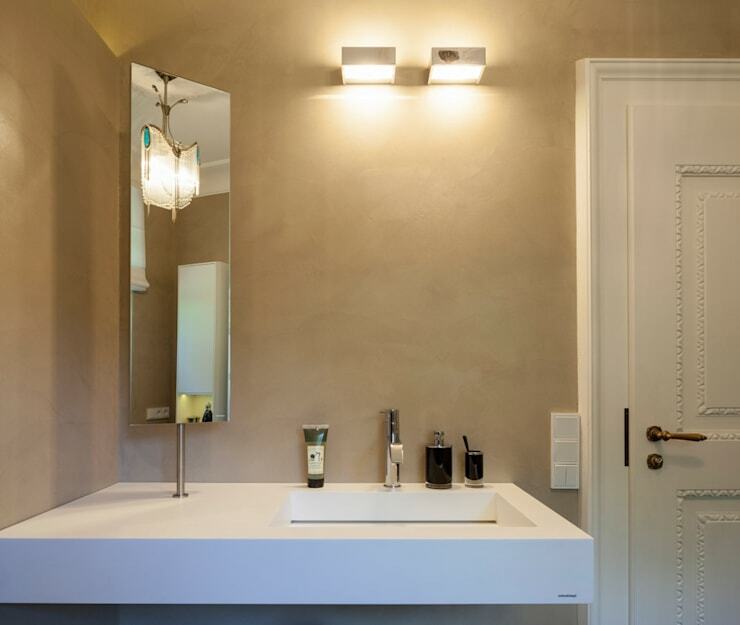 In the example above, the bathroom walls are lined with polished cement. 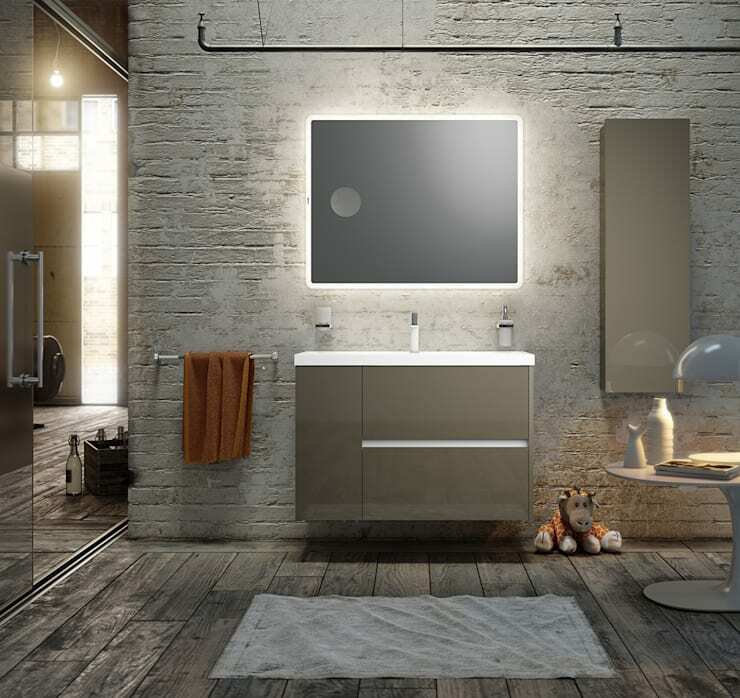 However, it still displays a classic and warm style that makes good use of the lighting and other bathroom essentials. Painting the bathroom walls can be a simple option in transforming its look. There are many paint types that have waterproof and quick-dry qualities – perfect for the bathroom. These are more suited to resist moisture, creating a barrier against it to prevent mold from developing on the walls. As you can see from the featured bathroom above, a fresh coat of paint in the right color can jolt life back into an old space. Bright green walls are a vibrant choice especially when paired with the minimalist style of the furnishings. When it comes to pricing, stone can be quite expensive compared to other materials. If you want stone to line the walls of your bathroom, be prepared to shell out a considerable amount of money. However, stone cladding is truly a great option. 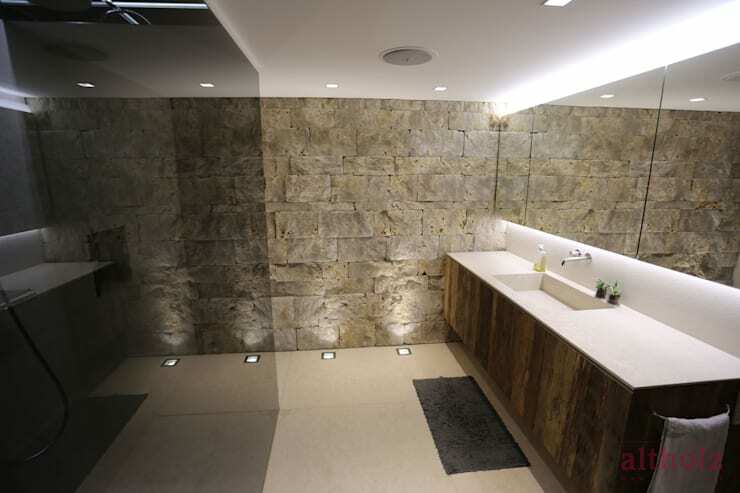 For bathroom walls without tiles, stone is a beautiful alternative. Certain stones such as marble gives the space an elegant finish, while others like slate and limestone are more rustic and charming. If you don’t want to spend too much on your renovations, there are alternatives. Stone panels are more affordable, but still features a very natural finish. Last but certainly not the least, brick is a good option. Not everyone would be willing to install brick in their bathrooms because it requires constant and thorough maintenance. However, the distinct stylishness of brick can be hard to resist. As seen in the chic bathroom above, the aesthetic value of brick is priceless. For more bathroom design tips, check out the most common bathroom decorating mistakes – and find out how to avoid them.